Since 1933 Pompilio's Restaurant has been serving authentic Italian cuisine since Prohibition. 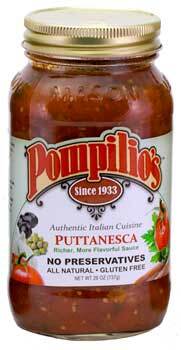 Their Puttanesca sauce is filled with the Old World flavors of Naples and Sicily in a rich and tangy tomato sauce. Ingredients Tomatoes, Black Olives, Celery, Capers, Water, Garlic, Olive Oil, Salt, Onions, Anchovies, Oregano, Parsley, and Spices.